Have you ever had the chance to drink pure coconut water directly from the coconut? If you haven’t, I highly recommend it. It’s one of life’s great pleasures — a moment of true, delicious authenticity. Besides the refreshing taste, did you know that coconut water has incredible health benefits as well? Marketers have been on to this for years, selling boxed or canned coconut water as an antidote to dehydration and fatigue. At Hope4Cancer Treatment Centers, we provide fresh young coconut water to our patients daily at our juice bar, because we know that nutrition is an integral part of the healing process. The coconut palm is known in Sanskrit as “kalpa vriksha,” which means “tree which gives all that is necessary for living.” Many cultures in areas where the coconut palm is prominent have developed a multitude of uses for all of its parts. The leaves can be used to thatch roofs and weave floor mats or fans for beating the heat. The husk of the coconut (called coir), besides serving as a natural bowl, can be burnt for heat and light or harvested to make rope. The budding flower can be turned into palm sugar, and boats can be made from the dried midrib of the trunk. The tree as a whole has many uses, but the most versatile part is its fruit, the coconut. Coconuts contain both water and meat, which can be combined to make coconut milk, or eaten and drank separately as soon as the shell is broken. Yogurt can also be produced by introducing starter cultures to coconut milk, and coconut oil (which has numerous health benefits of its own) can be produced from copra, the dried meat of the coconut fruit. Coconut water is a naturally isotonic beverage, which means that it contains the same concentration of salt as our cells and blood — this is why many call it the “fluid of life,” and why it is perfect for re-hydrating and rejuvenating the body. In fact, coconut water IVs are not unheard of as a short term measure, as it is also a universal donor for human blood plasma. It was used to give emergency plasma transfusions to wounded soldiers during the Pacific War of 1941-45 and still saves lives in third world countries today. Incredible, right? As a drink to rehydrate and rejuvenate the body, coconut water offers a refreshingly natural and incredibly beneficial experience. That’s why it’s a staple at our juice bar in the evenings, and one of our patient favorites at that. We serve our patients coconut water that is fresh from the fruit (we often go through 20+ coconuts a day! ), as once it is exposed to the air, it begins to lose many of its nutritional characteristics. This is by far the best way to drink coconut water, and can’t be matched by bottled or canned coconut water sold in grocery and convenience stores. If you have the opportunity to buy fresh coconut and drink the water, do it! 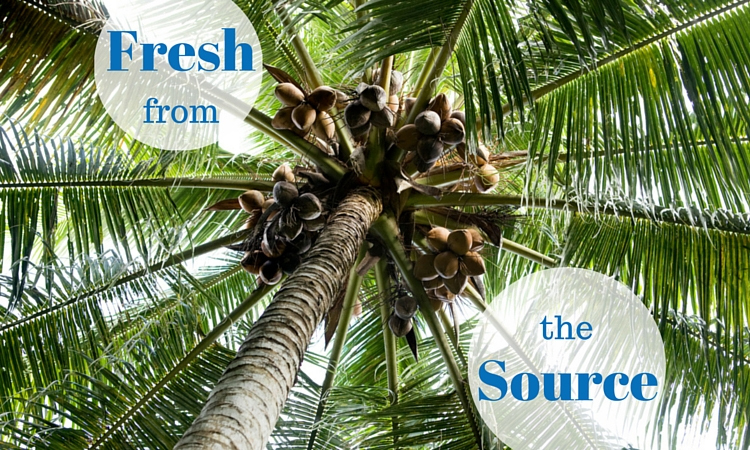 What’s your favorite experience drinking coconut water fresh from the source? Share it by tweeting @Hope4CancerMex! I read somewhere that people with cancer shouldn’t consume coconut products. But I drink the water out of the carton container, and if had the opportunity would drink it directly from the coconut. Coconut water is fantastic, don’t let anyone tell you otherwise. Please don’t consume the stuff you get full or preservatives and sugar though – be watchful of that please! I am a colon rectal cancer patient. I was told from friends that I should try to drink fresh coconut water daily. Can I also eat the flesh from the fresh coconut apart from drinking the water? Hello Carolyn and thank you for reaching out. We are not able to give medical advice directly through our website, but please contact our admissions office at 888-544-5993 or go to https://hope4cancer.com/schedule-a-call/ and fill out the form and one of our admissions officers can get you a consultation with our doctor. Can a patient who is been given Chemotherapy drink coconut water.? If not why.? If yes why? Pls help me with this I’m lil confused what to do whether to drink or to not. Good morning sir/ madam.pls can I drink coconut water for Colon cancer treatment. thanks. Hello Mary! We are not able to provide that sort of advice through our website or any social platforms. We recommend checking with your doctor.